Tam, from Benda Nui Sam took Stephen and I on a boat trip to the Cham Village across the river from Chau Doc. They have beautiful materials there, this Cham girl was making some on a kick loom (I think that is what it is called). This is one of the street side restaurants. Phuong, Tram, Quang (Tram's father) and I stopped there for a bite to eat about midnight one night. The service is just incredible everywhere in VN, even in the stores you get assistance the minute you walk in the door. Not like at home where you can holler and whistle and just about set the place on fire in a lot of stores and not have any luck attracting a staff member. There was a band at the restaurant that I went to with Thanh and his wife. Her mother and father and brother also came. Anyway the band was playing this crazy VN music that I just love, I've never heard anyone play a guitar like that, they get sounds out of them that just don't seem natural coming from a six string. It was hard to choose one from the 5 or 6 videos that I took at Onh's house. The kids were having a ball, singing, dancing or just running around. The "snow" in the bowls was a big deal that night. I don't know if there would be so much excitment for the real thing, it never really gets too cool over there. I've mentioned that the traffic is pretty interesting. 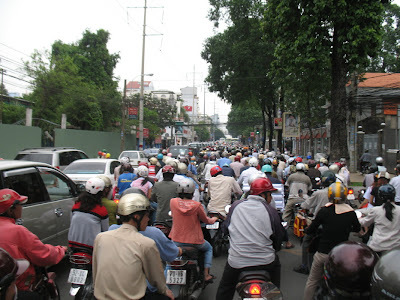 We would have constant grid lock if we had to move as much traffic on our streets as they do in VN. There is a system and it is very efficient. Watch this a couple of times and watch as the bikes and cars just move across and between each other. They move like a school of fish or a flock of birds. I only saw one accident in the 6 weeks that I was there this fall. I think this is a great video even though you won't be able to understand a word of it. The interest that these students exhibit in listening to Hung shows that they are keen to understand the art. Everyday there were groups of these university students coming through the gallery, it is really refreshing to see. I am reassured that the public does appreciate art, even at home, because there is very little difference between people where ever they live. Remember to start at the bottom of each blog page to see it in chronological order!! 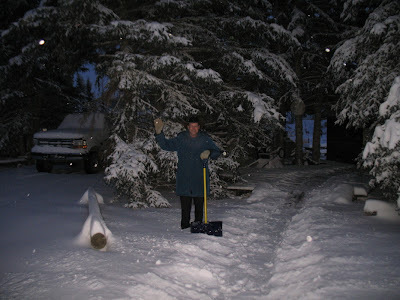 When I got home there was lots of snow and the weather hovering around a chilly -30. Kind of a shock after 90-100 degree weather in HCMC for the last 3 weeks but it really is beautiful and we do know how to cope with it. Glad to be home but already thinking about travels next year and of course starting to plan for Bergen Rocks. Russia starts in mid Aug so I guess that will move the Bergen event ahead a couple of weeks. Hope we can get something going in a community somewhere, sometime but in the meantime it is a pile of fun doing it out on my acreage. I had to go home some time, bummer. On Dec 9 my plane to Hong Kong flew out at 6am so I had to be at the airport for 4. Hung met me there and after I checked in we had about an hour to do our last visiting and try to make some last minute plans for projects we have planned for the future. I think we are going to see a bunch of Vietnames sculptures showing up on a ship this summer for a nice exhibit in my sculpture park. I think there might be enough to create exhibits in a couple of other places too. Maybe somewhere in Olds and Carstairs for example. Would be a good way to create some tourism in our area.....working on that now. Sorry to have to leave VN, it is such a beautiful country, warm weather, friendly people and, I don't know if I mentioned, the food is awesome. Two of the organizers from the 2005 symposium came to meet us for breakfast. I was really glad to see them. Mr Hui (I think, so many names and I don't always keep acurate notes) and Miss My. It is so nice that these people make such an effort to show hospitality. That is a standard in the VN culture and a quality of the people there that makes me love that country so much. Simply titled "Eagle" I hoped that there would be some recognition for the fact that in VN and in Canada we have many similar things that are important to our cultures. Same goes for the buffalo. To project that a little further maybe people will realize that we not only have animals that are similar and important in our cultures but actually the people too. We are all in this together. 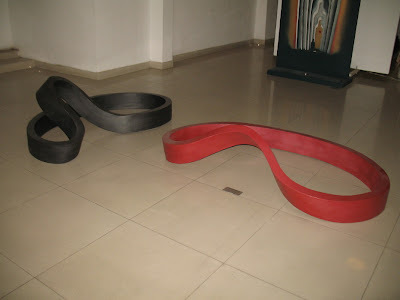 These are the two pieces I made at Nui Sam in 2005. The buffalo is titled "Spirit of Navarre". Before I left for the symposium my great friend Buck (Navarre) Massey told me that he wanted me to make him a buffalo sometime, he used buffalo in many of his artworks. 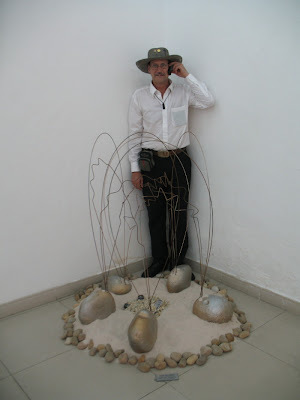 Ironicly when I got there I decided to change my sculpture from a water buffalo to a North American buffalo....and then news came that Buck passed away while I was working on this piece. So naturally this one was for him, happy hunting Buck. 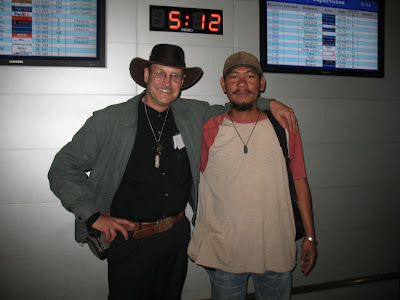 A good friend of Stephens passed away recently, they had made a pact that when one of them "went" the other would take his ashes and spread them around the world. At the park Stephen put some of his buddies ashes on his (Stephen's) sculpture and after a short time of reflection scooped them into his hand and blew them into the wind. 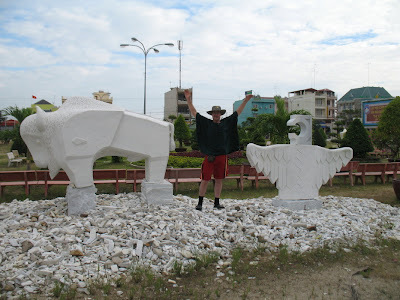 About six of the sculptures were placed in Chau Doc, I put this one by Liem in as it shows the scale of the sculptures. I was happy to see Liem in HCMC during my visit this fall, on New Years eve 2006 I was in HCMC and walking to meet with Paul and Janet Haggins to ring in 2006. Ha ha, I ran into Liem on my way, he was headed to meet friends too. Pretty neat to meet someone you know walking down the street on the other side of the world and in a city of 8 million people. Well, maybe I do have some favorites. This one is by Hori Yasushi from Japan. He worked near my site at the symposium, I was blown away with it.....and still am. 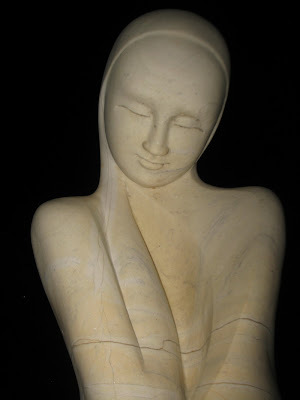 Carol Turner from Oregon did two sculptures in 2005, this one has such a peaceful face. I just loved it and the other one she did there too. Ironic that a sculptor from Oregon, Jim Gion, attended the opening and after we talked for a while realized that Carol is a freind of both of us. I worked with her in Penza this year also. Maybe we'll be fortunate enough to have her visit Alberta sometime and do a piece for us there. 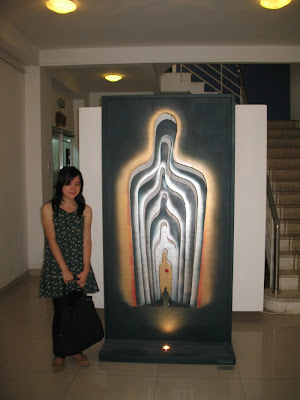 This one by Luong Van Thanh in yellow marble is pretty cool I think. 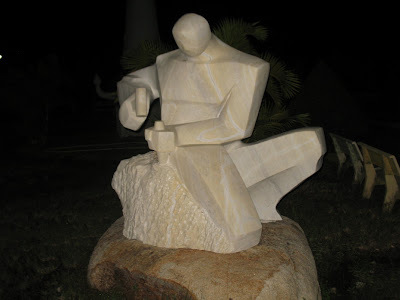 There were 68 sculptures created at the symposium. I took pictures of all of them but can't put them all on the blog so I just picked a few at random. My choice doesn't reflect any preference, they are all awesome I think. 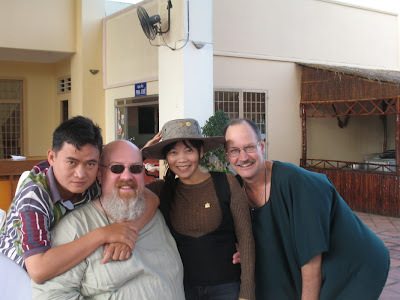 Stephen Turner and I took a trip to Chau Doc, where we participated in a symposium in 2005. We got there late, it was dark. 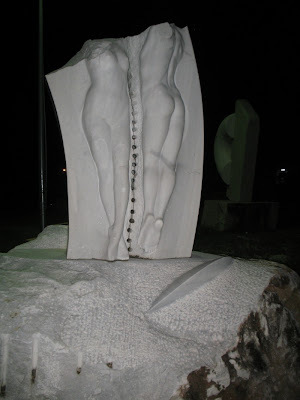 I decided to try and take some pictures of the sculptures in the park that was created there. I really like the way they turned out, the flash highlighted the sculptures nicely and the background in black. This sculpture was created by Onh whose home and family I visited during this trip. It is called "Cow Race", a tradition in a community in northern VN. He lives outside of HCMC about 30km or so, it's great to have friends to visit when traveling to different countries. 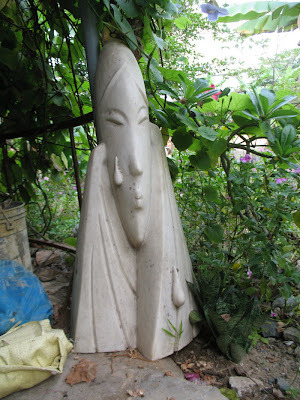 Another sculpture, white marble, in Thanh's sculpture park. 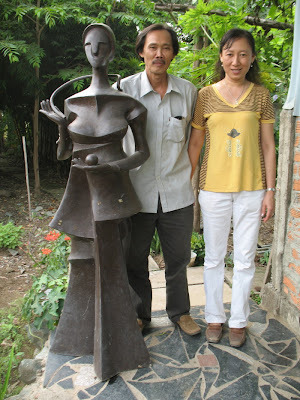 Thanh and wife in front of the studio and a sculpture in his park. 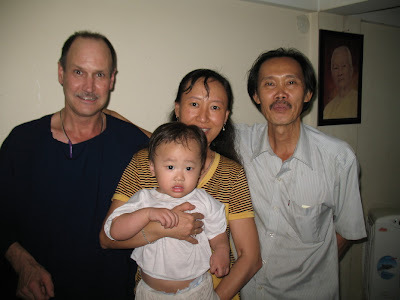 I believe it was the day before visiting Onh that I spent the afternoon visiting Thanh and his family. Here his wife and youngest daughter. We visited the new sculpture park that he is developing and then of course off to a restaraunt and an awesome meal. His wife's parents and brother joined us at the restaraunt. Had to include a traffic shot. There are more and more cars in HCMC but still lots of bikes. It looks jammed but really this traffic is moving along pretty good. It would be grid lock in Canada if we tried to move the volume of traffic that they do using our system. There the traffic moves like a school of fish or a flock of birds, next year I will create an installation sculpture on this topic. Pretty excited about that, sounds like it might be in Vung Tao about May. I can't stop taking pictures of the food, boy do we have a boring menu at home. Everthing is absolutely fresh and delicious, this is kind of the appetizers the night I was at Onh's. New dishes kept coming out all night long. 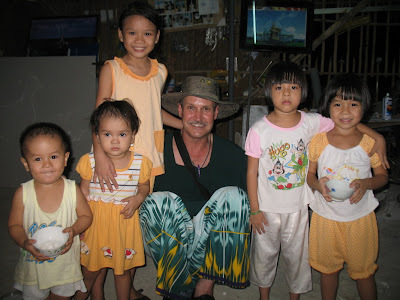 This is Onh, his wife and two daughters. Behind us is a model of a new sculpture he is working on. The finished sculpture will be about 640 ft tall!!! I think that's about the hieght of the Calgary tower. I think it was December 4th that I visited Onh and his family, I know I'm repeating myself but we had an incredible meal and a great visit. Some neighbors and kids came over too so there were about 15 of us all together. The kids have bowls, they had scraped some styrofoam into "snow" and were having a blast throwing it up into the air, lots of giggling and laughing. 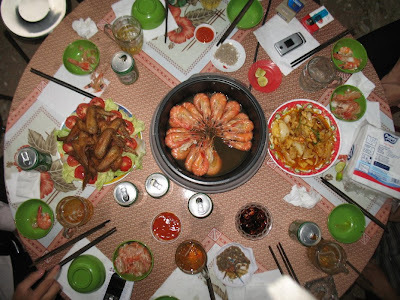 Another evening and again at an outdoor restaraunt, this one specialized in seafood. Man, I could live on that stuff. The snails were really pretty (on the left) all covered with spots, it was all delicious. 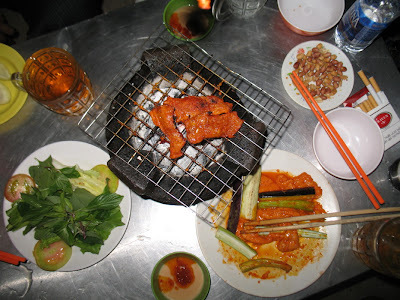 One evening Phuong, Quang, Tram and I stopped at a roadside restaraunt about 1am and had a snack. The food is always delicious and I think just beautiful too. At this place they bring a small BBQ to your table and cook the food right there. Everytime I go to HCMC I go to visit Pham Van Hang, and each time I try to get a photo of his home that will do it justice. Never have been successful but I think this is the best one I have so far. 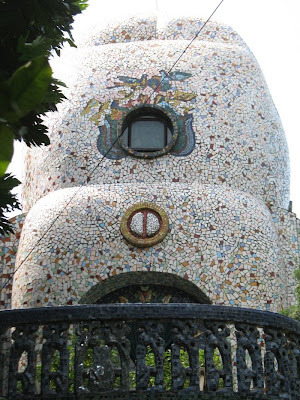 It is a work of art in itself, the surface made from broken tile is obvious, check out the hand carved railing around the balcony. I think this was the night of the exhibit opening. Afterwards we gathered at this restaraunt, had an awesome meal and, of course, lots of toasting. 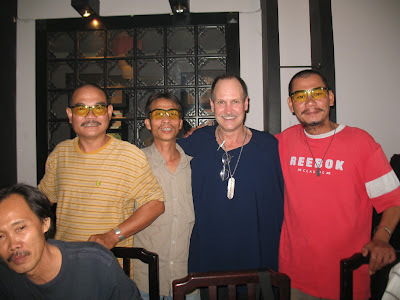 At one dinner we had I gave some of the guys yellow safety glasses. These are great for sculpting white marble as they let you see the contours of plain white material. That's why they work so well for snow too. From left to right: Thanh (sitting) Minh, Chien, me and Hung. 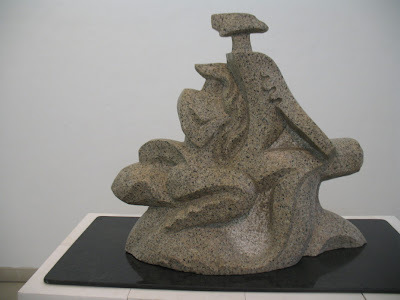 Choi's sculpture, and at risk of being wrong I will give my interpretation. To me it is a comparison/demonstration of forms made by nature and by man. The glass element is an interesting object. The glass is layered about 1/4 inch increments. I spent quite a bit of time looking through/into it. Sometimes we just don't see things that can be interesting until we take the time to look little deeper. Hung let me take over when it came around to my pieces. Ice, Wood and Fire attracted a lot of interest. I'm really pleased that this one attracts the attention that it does, I was quite sure that it was something good when we made it, (collaborative work with Shirley Paradis and Tracie Ward during an art festival called Ice, Wood and Fire.....). After this exhibition it will be collected by the Penza Museum of Fine Art in Russia. 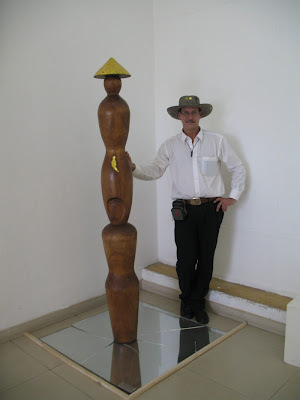 Professor El Ferol has a degree in archeology, many of his works reflect that background. 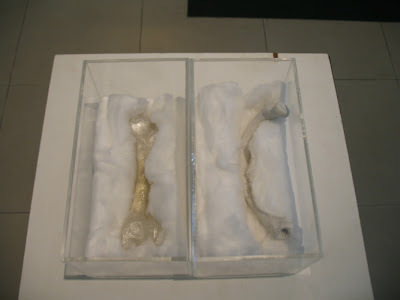 This is representations of two bones, one from glass the other in porcelain. Exhibited in an archival fashion as if in a museum. 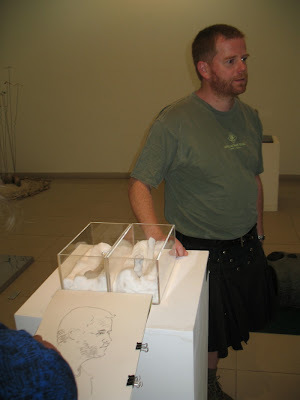 Glass boxes, and laid gently on cotton. One of Minhs pieces. I won't attempt an interpretation, for me just an interesting/curious form. Totally different when you walk around behind it. Awesome! You might have noticed that I have signiatures all over my hat. I have been making a project of that for a few years now, each trip a new hat. They get hung up in my house when I come home and make great reminders for me. Here art students are adding their "John Henrys". Hung is giving them a talk about some of the sculptures in the exhibit. 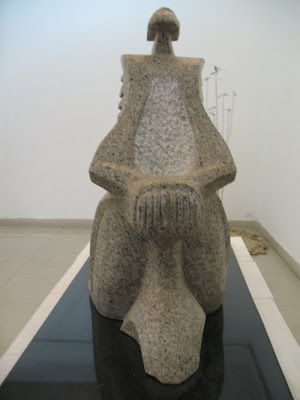 Another of Nam's sculptures, titled "Rain". From the side you can see why, the lady is laying up against the man. Obviously they got caught out in the rain, maybe on their way home. It is light colored granite. Nam is head of sculpture department at HCMC Univerisity of Architecture. Throughout the exhibition I was at the gallery quite a bit, kind of a central meeting place for us and office services, good cafe etc. Seems that there was always some art students there and at least one of the sculptors to talk to visitors to the show. 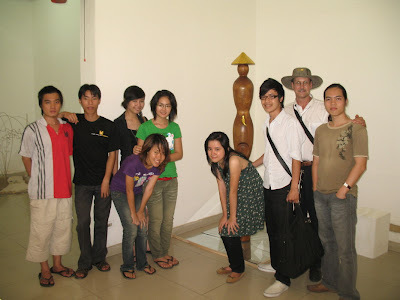 This group of students from the Fine Art University wanted to take pictures of me with them and my sculpture, it was a gas talking to them about their work and mine and stuff such as what the fishing is like in Viet Nam. Strips, by On. I won't attempt an interperatation. 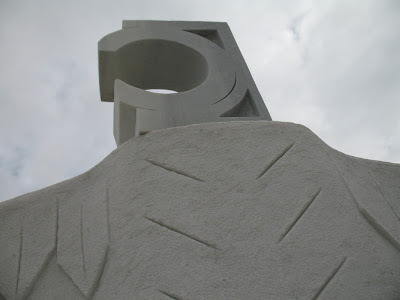 To me just interesting forms that "live" or change as you walk around and view the sculpture from different angles. Pretty cool. One of Nam's, from black granite. You can't see it in this photo but there is a hand on each side sqeezing the face into a contorted form. I think it is addressing the pressures that we all face in these modern and better (?) times. 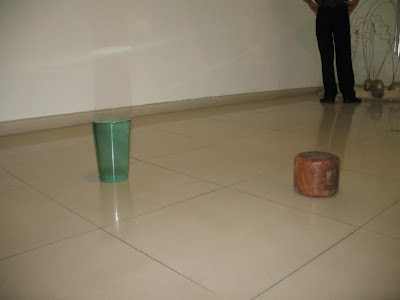 Another of Hung's pieces, I won't explain how it is formed. You can see quite clearly what is there. I think it is beautiful. 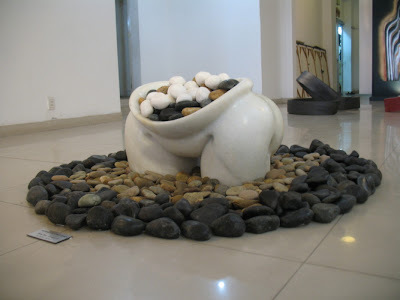 One of Hung's sculptures. This one is obviously about today's technology. 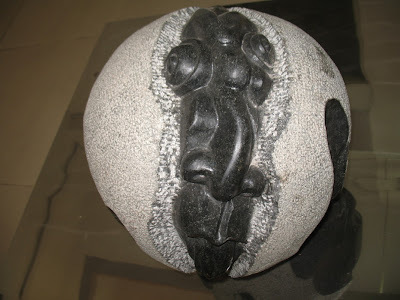 Five stones represent five continents, there are cell phones buried in the stones in the centre and joined by many wires, some bent like radio waves or electric signals of some kind. I made a call on my cell as he was taking the picture. HUYNH PHUONG DONG doing Paul's portrait. It takes him 3 or four minutes to do one of these. Paul really gets the looks truckin around VN with his kilts on. But I think there is a lot more acceptance for things that are a little different there than there is at home. I don't mind wearing a sarong, they are comfortable, offer protection from the sun and a little breeze gets in there. Don't think that woud go over at home, there'd be a lot of snickering and rumors started. We really could learn a lot from other cultures. I can see that in comparison to places in Europe and Asia, that I have been to, the attitude at home is "if it don't conform to our ideas then we aint interested, don't want no part of it." This is a front on view. The man at the bottom, woman standing on his shoulders and a baby in her belly. Gold foil on the hat represents sunshine and I applied the gold to the baby too because babies are the sunshine of families. Well, that's my interpretation. 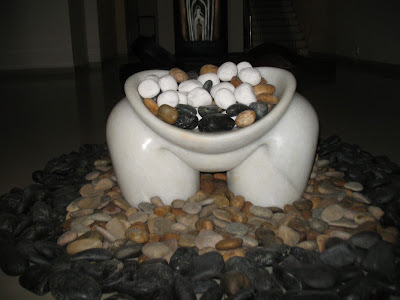 I used a mirror for the base of my sculpture "The Heart of Viet Nam". 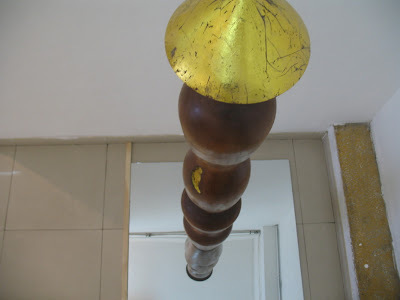 I think it provided something interesting, from a distance it was not noticable but when you walked up to it and looked down in the mirror the piece doubled in size. It's been said so many times that everyone likes art. 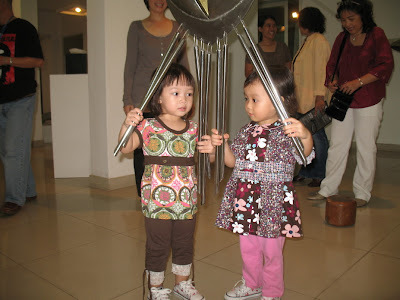 Even these toddlers are having a great time at the reception exploring elements of the sculptures they find interesting. 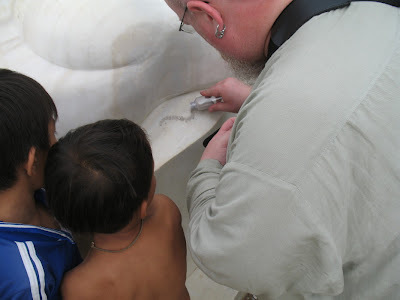 Most sculptors are pleased when children express interest in their works, including me. Indicates there is a generation of art enthusiasts coming up. These girls were the reception party at the door for the opening night. Like I mentioned, they seem to think of ways to really make these things seem special. Well, I guess they are special events over there, working on that at home. 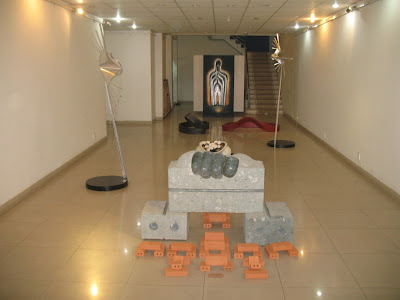 One of the other spaces at the gallery we used for our exhibition. In the forground is Bui Hai Son's sculpture (Sorry, don't know the title). In the back on the left is Hung's and on the right one of mine. 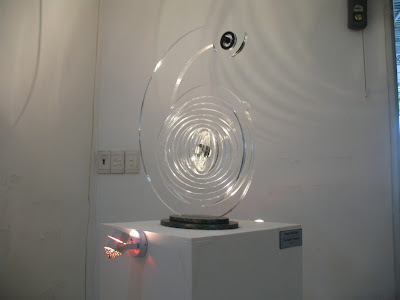 Another of Phuong's, this one made of acrylic and using light as an element. I really can't pick a favorite, all the scultures were good. 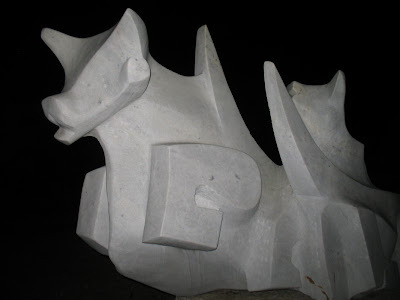 This sculpture, "Herd" is by Phuong, another friend from past visits to VN. 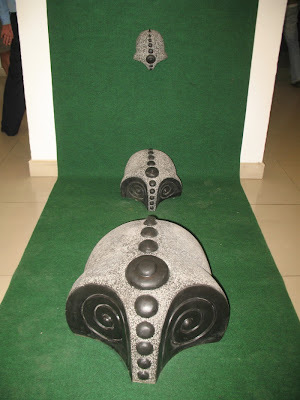 I loved this piece made from black granite. 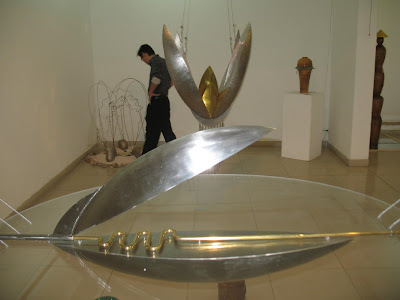 This sculpture by Minh, a friend for several years and very active guy in the Fine Arts Association.The sculpture in the forground in the picture below is also his. This is a shot of one room in the exhibit, there were three all together. A lot of fun and some hard work was involved on the installation, some of the stone sculptures were really heavy and lots of little details to attend to. All at the same time the walls were being painted, electrical services moved into place etc. Paul Haggins from Ireland came over to see us all and so did Stephen Turner from Calgary. 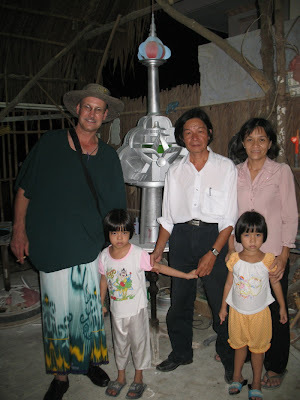 It was really nice of them to come and support us and the event, Stephen and I traveled to Chau Doc for two days to see how the sculptures we created there in 2005 and the park they've finished since looks. I am always impressed at how formal these things are in other countries, this picture is taken at the press conference. I didn't notice until I got home that the banner in the back is actually just for the press conference. A huge box of roses on the table and all. I hope to move toward nice stuff like that as the symposium in Bergen develops, right now it is grass roots and maybe we can fancy it up a little if we get some support in the future. Until then I don't think anyone is disappointed with what we did, participants realized it is a grass roots event, that there were very few people involved in organizing it. 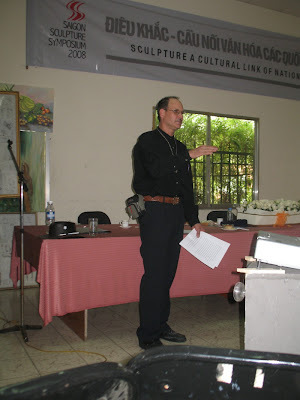 On the 28th an activity that is a new twist, I think, for symposiums was the sculpture conference. It was a full day program, Choi, Noell and I presented papers. 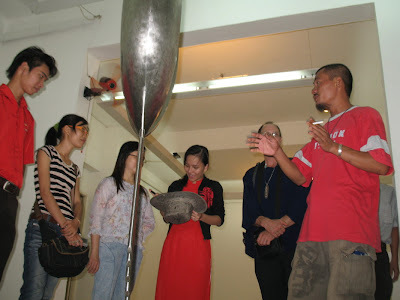 Several artist from Viet Nam made presentations, it was awesome. This is something that should be part of every symposium I think, what a great idea! When I think about it I realize that symposiums on dentistry are basically conferences, same for engineering and all others. Sculpture symposiums are basically working events, it was great to share ideas in a more formal setting, it was very informative and interesting. Look for us to have a seminar in the program for Bergen Rocks 2009. I think another good idea to incorporate is to invite the public to attend. Mr HUYNH PHUONG DONG sketched portraits of many people during the opening and at the conference. He is a very well known painter and it is really an awesome memento to have my own portrait drawn by him. I will frame it and hang it prominently in my house. We got our flowers, cut the ribbon and then the opening reception ensued for about 3 hours, a very nice time. 31st was dispersion day but I don't think anyone left. I was staying on until the 9th of December, Choi and Noell were interested in stone and tools etc so it was a few more days before any one left. I think we got together most days for supper, after a couple of days I took up other friends on offers to visit their homes and families.......even though I was there a total of 2 weeks I just didn't have enough time to do everything I would have liked to. 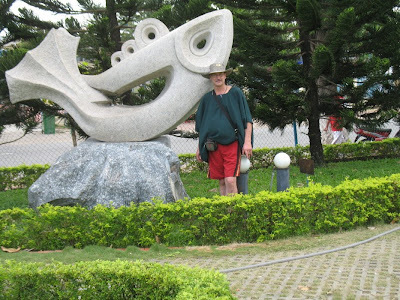 29th we all traveled to the Saigon Tourist sculpture park, wow again!! I would guess there are about 50 sculptures there, many by artists that I know. We met up with some of the artists that have work there, it was really nice to spend the morning walking in the park and discussing our inspirations techniques, materials and lots of other things. In the afternoon we went to the studio for an hour or so and then off to a nearby restaurant for the remainder of the day. Great food and great company. On the 30th we went fairly early to Pham Van Hang's. 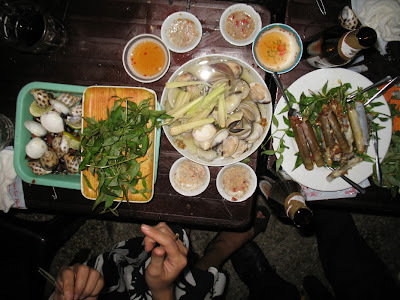 Soon after arriving a veritable feast showed up, I just can't get enough of that Vietnamese food. 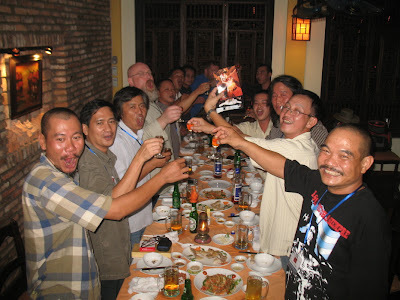 Basically, a great time again and then in the mid afternoon the group headed out to the Ho Chi Minh City Museum of Art. What a cool symposium this was. Each of the 5 days activities relating to art were planned for us, we always had someone making sure that we weren't getting lost or getting late. As usual I had a super time and couldn't begin to mention all the great stuff that we were treated to, this is only a sample, really!!!! I came a little earlier than the others as I had a few things I wanted to do before the symposium started on the 25th, I got there on the 21st. 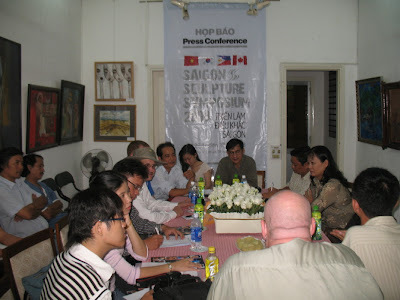 Installation was 26th and 27, a press conference in the afternoon of the 26th and the opening ceremony was at 6pm, 27th. The opening ceremony was beautiful as usual at these events, after several speachs we were all called to the front, introduced and presented with a boquet of flowers, pins and othere mementos. Then for about 3 or 4 hours there was an open house at the gallery, the place was packed and there must have been a thousand pictures taken. 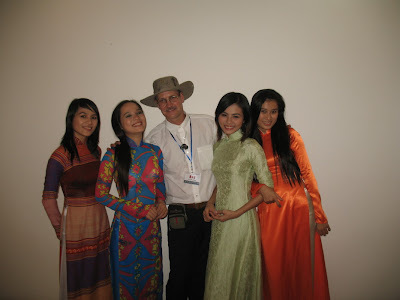 I met lots of nice people and saw many more that I know from my previous 3 trips to Viet Nam. 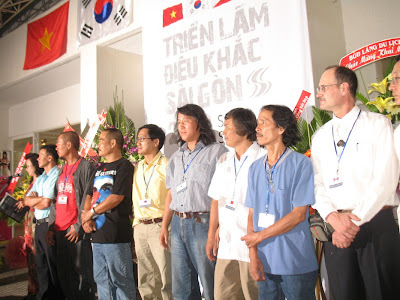 Some came down from Hanoi, others from Chau Doc and points between. How nice that was!!! 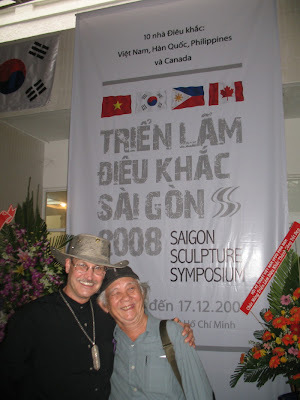 After spending the first three weeks of November at home (in Canada) I returned to Viet Nam for the Saigon Sculpture Symposium. 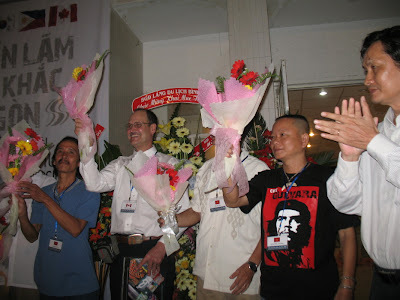 This is an annual event sponsored by the Ho Chi Minh City Fine Arts Association. 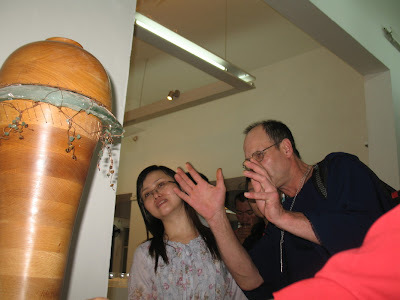 This year was the first that foreign sculptors were invited, of the eleven that showed sculptures at the Association's Gallery near downtown HCMC 3 of us were from other countries. Noell El Farol Professor of art at University of the Philippine who I have worked with before, it was great to see him again here. The other Professor Choi OK-Yeung...Wow, in addition to his work at Kangneung National University Choi has an art park in Korea that is out of this world, I sure hope I get a chance to see it some day. Just the pictures that he showed are incredible, it would be like being in a dream land to visit there I think.